Many years ago some time in 1986, at Hyderabad in India, Centre for Cellular and Molecular Biology (CCMB) had in collaboration with School of Arts and Aesthetics, Jawaharlal Nehru University, organized a conference on Arts and Science. Some six Nobel prize winner scientists were invited to interact with artists from various walks of life and fields: dance, music, film, painting, sculpture, literature, architecture and scientists from within India. I had till then not heard of CCMB or the Director scientist Dr. PM Bhargava. That collaboration opened up a new way of looking at arts with a scientific approach, for so many of us and artists. Dr. Nakra is an electrical engineer by profession and had worked as a research engineer at the Hydro Quebec Research Institute (IREQ). Since he had studied the possibilities of engineering applications of artificial neural networks for developing intelligent power systems, it helped him enter the realm of neuroscience. He took private studies in psychology, neuroscience and the role of dance in child development. Dr. Harbans Nakra’s wife Dr. Mamata Niyogi Nakra is an internationally renowned Bharatanatyam dance guru, choreographer, scholar and writer, deeply interested in dance education for children. She has been teaching dance for past 30 years in Montreal, Canada, at her institution Kala Bharati. Her book Shishu Sadana with a child friendly Bharatanatyam repertoire along with a DVD showing creative process involved in producing it is an important landmark in dance and child education. Observing wife Mamata’s work and discussions with her has given Dr. Nakra several opportunities to further his interest in this study. Both of them have been attending Dance and the Child International (DaCi) conferences, where in 2000 at conference held in Regina, Canada, Dr. Nakra presented his earlier paper which dealt with scientific basis for the role that dance training can play in whole-child education. It received encouraging response and he continued his research and further studies in that direction presenting papers at subsequent conferences held at The Hague, Netherlands in 2006, Kingston, Jamaica in 2009 and at the 4th Biennial Provoking Curriculum Conference at The University of Ottawa in 2009. The views expressed in these presentations have been updated and integrated in the present book. Dr Nakra has described a model of the Human Brain – Behavior System based on the view that brain is an information processing system with an input from the sense organs and an output that represents behavior. Between these two end points, seven processing Functions are described. The first letter of each of the above has been shown in bold to highlight the remarkable acronym that emerges. PAIDEIA is an ancient Greek term that referred to a system of general education. The descriptions of these functions, Dr. Nakra explains, include two important elements of the system: Cognition and Empathy. Neatly divided into three parts in Part I (chapters 1 and 2) our current understanding of the human brain-behaviour system is described. 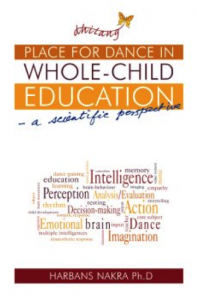 This provides a scientific basis for defining the needs of developmental education, which are presented in Part II (chapter 3) and in Part III (chapter 4) the potential of dance training for meeting the needs of developmental education is presented. Dr. Nakra believes that this will justify a solid pedagogic footing for the inclusion of dance as a subject in the school curriculum. In chapter 1, the principal functions of the human brain-behaviour are explained with help of a simple diagram. Following pages deal with Perception, Analysis and Evaluation, Intelligence, Decision-Making , Emotional Brain, Empathy, Somatic response, Effect of Emotions on other functions, Imagination, Action and the integral functioning of the human-brain behavior system. This provides a framework for understanding human behavior in terms of various functions of the brain. Chapter 2 deals with brain, memory and learning. It is significantly enhanced with incoming information, a number of associated signals, previously acquired informational elements, recalled within different contexts and so on. Dr. Nakra emphasizes corrective feedback as essential for good learning. Chapter 3 deals with defining the needs of developmental education. After describing various processes, Dr. Nakra feels that the curriculum has to be designed to develop all the functions of the brain-behaviour system, including the development of multiple intelligences, imagination, the emotional brain and the skills of action and decision making. This has to be supplemented by linguistic capabilities and mathematical analysis. Mind-body coordination and sensitivity to emotional responses needs renewed attention in schools. Many of these needs can be met through training in dance. In the final chapter 4, Dr. Nakra deals with potential of dance training for meeting the needs of developmental education. He brings to bear upon his writing, close observation of teaching practices, watching performances and discussions with dance teachers, scholars and critics, carried out over a period of 30 years. Dance training contributes to the development of the perception function in two ways: it sharpens some of the senses and consequently the perceptional-cognition. The sense of hearing sharpens as accompanying music has to be listened to carefully. The visual sense gets sharpened, because one has to observe the movements and also subtle changes in the facial expressions. The sense of touch comes through the contact of the feet on the floor, and finally dance energizes the sixth sense as manifested through the response of the body. Dance training offers various possibilities for sensitizing the somatic response. The mind is made aware of the sensations in each part of the body during various movements. All elements of analysis and evaluation, decision making, imagination, action, expressional cognition and how dance helps multiple intelligences are well explained. culture specific stories, associated music and dance choreographies, a dance teacher offers choices to the students. Dr. Nakra rightly makes the observation that there is a difference between teaching dances as an art form for performances and teaching dance as an exercise in whole child development. The design of dance exercises and choice of choreographies, in latter case, have to be made with specific functions in mind. They must be age appropriate so that they take into account the child’s physical and mental development. Every child must benefit from dance training; that is, every child has a right to dance. The present study is an important contribution to dance studies. With a scientific approach, the author has shown many ways in which dance training can serve to develop and enhance functions of the human brain-behaviour system. Dance training as a subject more than adequately satisfies the criterion for its inclusion in the school curriculum. In the Epilogue, Dr. Nakra explains how he landed into the study of psychology and education, wondering about the value of dance in child development. However, we are grateful to him for following Margaret Fuller’s advice: “If you have knowledge, let others light their candles in it.” I am sanguine Dr. Nakra’s study would provoke further inquiry into the ‘Place for dance in whole-child education.’ Kala Bharati deserves congratulations for their initiative of brining out such studies in this direction. How intelligence function is explained showing external input suggests that any material included in the school curriculum must be checked against its potential for contributing to the development of these Functions: and based on this criterion, he concludes that dance training merits serious consideration for such inclusion. The book is not priced and is free of cost for distribution. For a copy, please send email to info@kalabharati.ca. Where required, only postage has to be paid to Kala Bharati. Dr. Sunil Kothari is dance historian, scholar, author and a renowned dance critic. He is Vice President of World Dance Alliance Asia Pacific India chapter, based in New Delhi. He is a regular contributor to www.narthaki.com, the roving critic for monthly magazine Sruti and is a contributing editor of Nartanam for the past 11 years.